“Kevin J. Leonard Award” in the Centre’s Leonard Library on May 10, 2017. The “Kevin J. Leonard Award” is presented annually by the University of Toronto’s Institute of Health Policy, Management and Evaluation (IHPME), in collaboration with UHN’s Centre for Global eHealth Innovation (Centre) to pay tribute to Kevin’s tireless advocacy on behalf of patients. 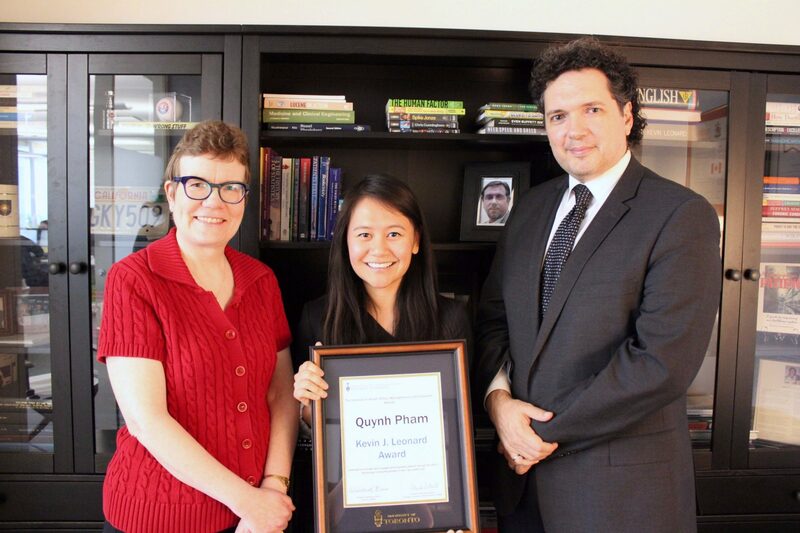 Sandra Dalziel, widow of Kevin Leonard, presented the fourth “Kevin J. Leonard Award” to PhD candidate, Quynh Pham, during IHPME’s annual Research Day on Wednesday, May 3, 2017. The Award recognizes students whose work engages and empowers patients through the use of technology to become partners in their own health. Excelling academically and already a published journal author as well as conference presenter, Quynh is undertaking work designed to promote patients gaining timely access to their own health information enabling them to better manage their care in partnership with their providers, a passion of Kevin’s. A keen researcher and evaluator, Quynh always keeps in mind, ‘Will this benefit the patient?’ – a query also front and centre to Kevin. Quynh is leading three research projects at the Centre. The first is helping to determine how the province’s Ontario Laboratories Information System or OLIS, a comprehensive database of health information captured by the healthcare system, can best open up direct access to patients, beginning with blood work. This is significant as patients will gain this access no matter where they live or which provider they see. Secondly, to broaden patient participation in research, Quynh is looking at the feasibility of digitizing patient consent – currently a face-to-face process – for the iCanCope mobile health app for pediatric chronic pain. And thirdly, Quynh is the Research Lead for a clinical trial of another mobile health app, NED or “No Evident Disease” which enables prostate cancer survivors’ lab results be sent directly to their smartphone, saving on patient clinic visits and the associated logistics when not required. Quynh’s energy and enthusiasm are infectious, and she has a tremendous drive to pursue her passions so reminiscent of Kevin. With her analytical approach, research skills and an eye always on the patient, Quynh will make a significant impact on patient care and the patient experience today and in the years ahead.